We understand festival is from October 4th, 2019 (Friday) to October 13th, 2019 (Sunday). 6th is the likely Zombie Walk date, i.e. the first Sunday. 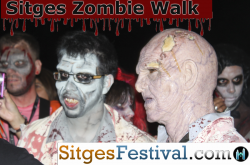 Sitges zombie walk is a procession of people dressed in zombie costumes who make their way around Sitges town streets in an zombie like fashion. All are welcome, as audience, casual involvement with a splash of red or full on inventive and sometime shocking outfits. 23:00 (11.00pm) Concert with Motorzombies at New Rickys. Concert admission: 6€. Limited capacity. ‘Zombies’ collect & start near ‘St Sebastian Beach’, pass the ‘Miramar Building’ next to Plaça Vidal i Cuadras square. Overlooking the Med. Through the ‘Gothic roads ‘and back into town, before arriving back on the ‘Promenade’. Sometimes over 1000, so the crowd can be large & the walk can take a while. Sitges zombie walk is a procession of people dressed in zombie costumes who make their way around Sitges town streets in an zombie like fashion. All are welcome, as audience, casual involvement with a splash of red or full on inventive and sometime shocking outfits.